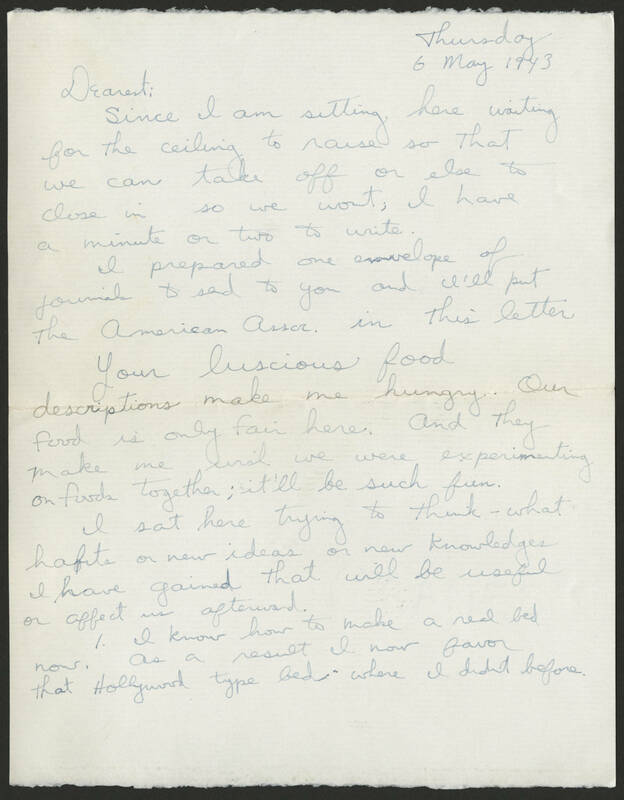 Thursday 6 May 1943 Dearest: Since I am sitting here waiting for the ceiling to raise so that we can take off or else to close in so we wont, I have a minute or two to write. I prepared one envelope of journals to send to you and I'll put the American Assoc. in this letter. Your luscious food descriptions make me hungry. Our food is only fair here. And they make me wish we were experimenting on foods together; it'll be such fun. I sat here trying to think - what habits or new ideas or new knowledges I have gained that will be useful or affect us afterward. 1. I know how to make a real bed now. As a result I now favor that Hollywood type bed; where I didn't before.